After our South African guests left we caught up with our various ex-pat friends who live locally and went out for a couple of restaurant meals. 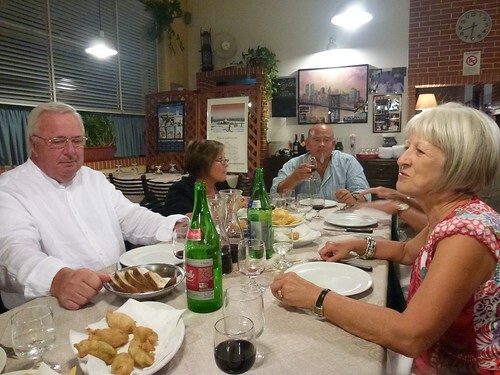 Thursday was Osteria Bell' Italia in Cisternino with Kath and Richard. Friday it was Pizzeria Pizz Birr in Locorotondo with the crowd. Pizz Birr's signature dish is crisps (chips to Americans) - thin slices of deep fried potatoes. The real thing, not what comes in packets in the store. The anti-pasti also included stuffed, deep fried courgette (zucchini) flowers - you won't find that in the local Italian in the UK. Meanwhile back at Trullo Azzurro the garden is turning out to be very productive. An unusual weed in the herb bed. 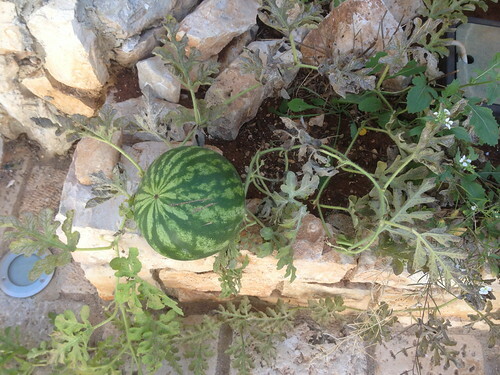 That'll teach me to be careful where I spit my watermelon seeds. 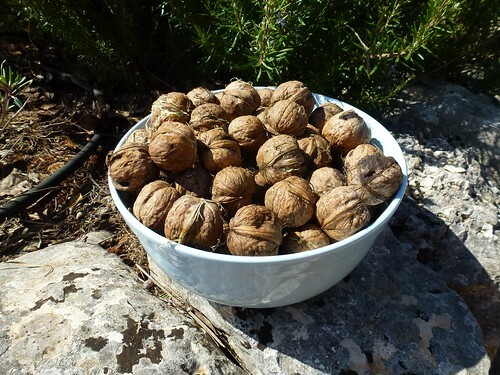 A kilo of walnuts! After years of sulking our walnut tree has decided to give forth. We also did a load of clearing out of the little sitting room and took delivery of a double bed in order to turn it into a second bedroom. This is in preparation for renting out the whole of Trullo Azzurro as a single property.